The HGH Micro Blasting Fine Finishing system from Germany is a revolutionary solution to improving EDM surfaces quickly, without damaging any fine details like sharp edges on a punch or die, or intricate surface detail on a mold or coining die surface. The process has been used extensively in Europe for over 20 years but it is new to the US. HGH and EDM Network are teaming up to introduce this process to our EDM community. 1. What is Micro Blasting? 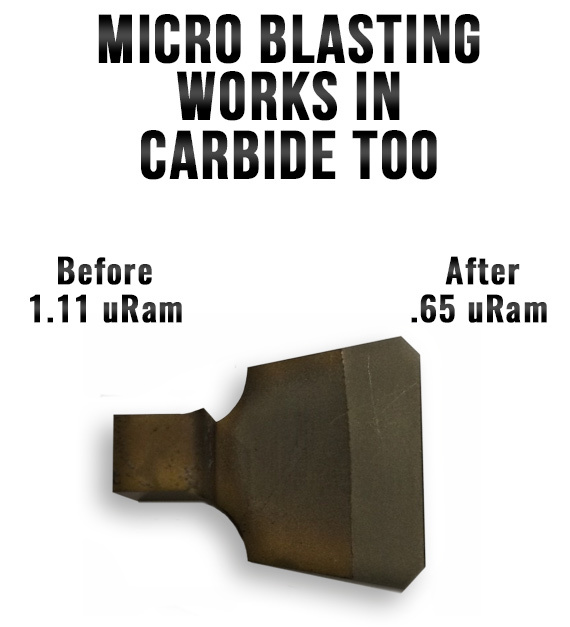 The Micro Blast process utilizes a patented selection of ceramic blasting media, that combined with the specially designed Gun and smaller pencil wand, can direct the media into small detail areas such as thin ribs or small holes to achieve the same improved finish results as on the larger surfaces, thus treating the entire EDM surface, QUICKLY! For example, With wire edm surfaces one rough to 3 skim cuts we can cut the surface finish in half in less than a minute! Go from a rough pass of 2.4uRa to 1.2 uRa with no skim cut or hand work. Or .63uRa to .33 uRa on a 3 pass cut, again in less than a minute. After 4 total passes the results are not as pronounced but still better than the wire cut finish. Click the image below to see how quickly our Micro Blasters yield results. 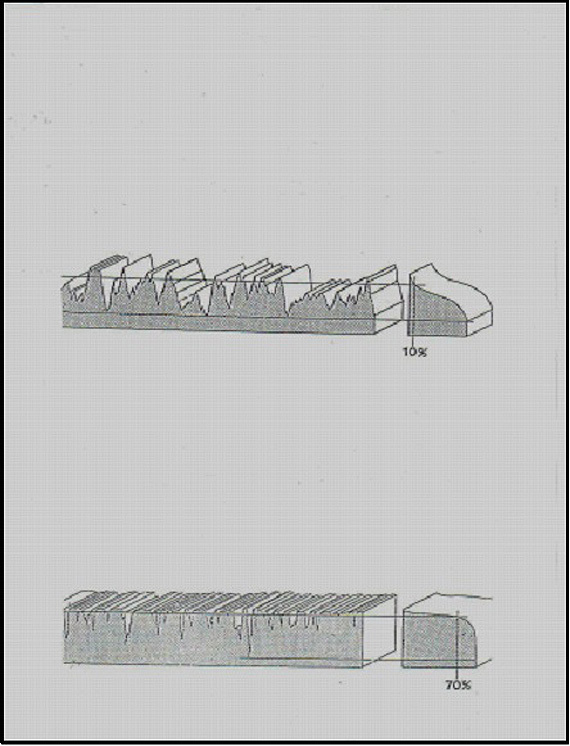 The Micro Blast process can be compared to high precision "Shot Peening" where you are compressing the high "peaks" left by the wire edm process, into the Edm "Valleys". The process is a two step process where the first step done in one Chamber of the System, removes the rough ReCast layer from the Edm process using a larger size ceramic media. Then, in the second chamber the media is much smaller, and the air pressure is also less. Each chamber is precision designed to use only new or undamaged media so that you are not blasting the surface with the recast material or broken media. THIS IS NOT GLASS BEAD BLASTING! Though similar in concept, the specially design hardware and patented media does not penetrate or contaminate the edm surfaces. 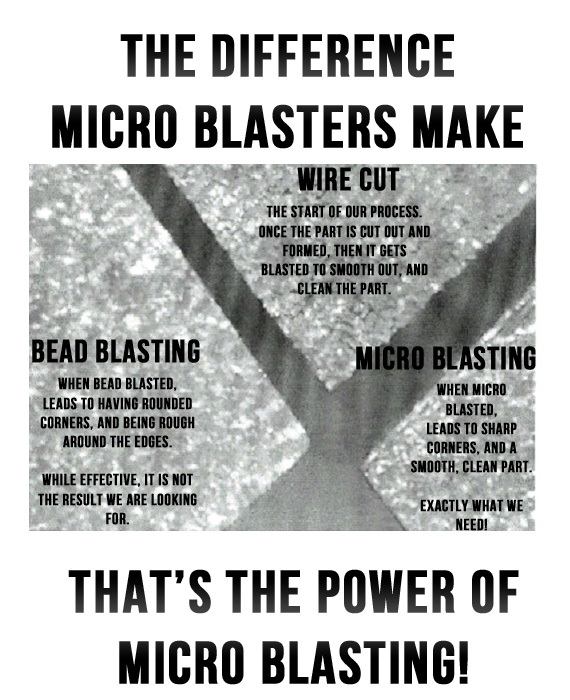 Click on the image below to see the difference that Micro Blasters make. 3. Does the Micro Blast process affect the part accuracy? 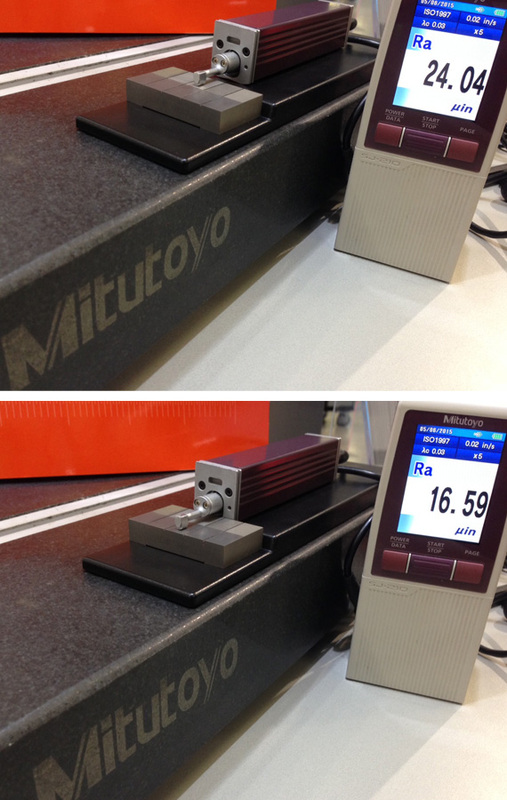 This process will change the dimensions on the surface minutely such as when going from a one cut rough cut of 2.4uRa surface finish, to the 1.2uRa we measured an dimensional step of .00015". That is because the peaks and valley are so great. However, after one or two skim cuts the dimensional change was less than .00008". After three skims it was not measurable. For sharp corners, here too after three passes on the wire edm a .001" outside corner after blasting, showed no measureable change. Click the images below to see how accurate the Micro Blaster process is. 4. Does it work on all EDM'd material? There are specifically designed media for different materials as well as processing technology for air pressure, part to nozzle distances, and other developed finishing techniques. Hard metals, Carbide, Copper Tungsten, any EDM'd surface will be greatly improved utilizing the Micro Blast process, QUICKLY, and AFFORDABLY! 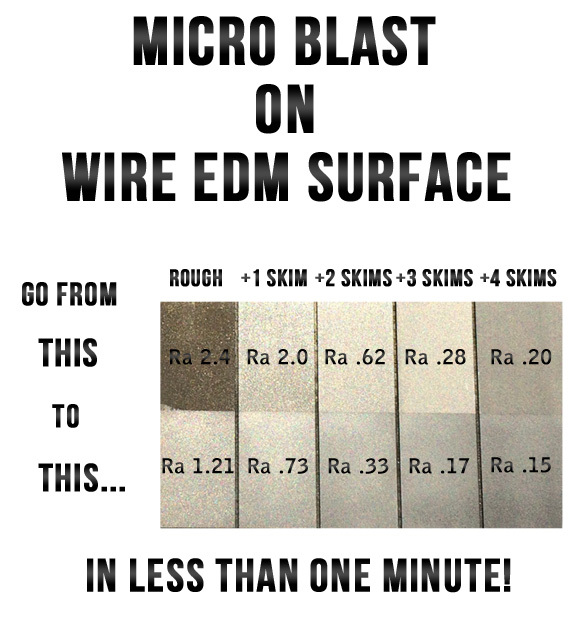 Contact us for a free demonstration of the Micro Blast Finishing System. Click the below image to see that our Micro Blasting process works on many different material types. HGH Micro Blaster News Article! THE UNITED STATES #1 SOURCEFOR ALL OF YOUR EDM NEEDS!